INDIANAPOLIS, Indiana, August 8. THE University of Arizona's Kevin Cordes lowered his own 17-18 National Age Group Record in the 200m breast that he set this morning on his way to a second place finish in the event. Meanwhile, Stephanie Peacock and Megan Romano collected their second individual wins of the meet to highlight another fast night of racing in Indy. Swim Florida's Stephanie Peacock, last night's winner of the women's 800m free, put her stamp on the 400m free early on, bringing home her second gold medal of the meet in 4:09.31. That lowered her personal best of 4:10.25 from last summer's World University Games and is the 40th fastest in the world this year. Catherine Breed of the Pleasanton Seahawks grabbed second in 4:10.24, with Clearwater Aquatic Team's Rebecca Mann in third at 4:10.76. Both Peacock and Breed's times would have placed in the top eight at Trials, as neither swimmer made the championship final in Omaha. Michael Klueh of FAST, the third place finisher at Trials in the men's 400m free, made the most of a second opportunity, winning the event tonight in 3:49.20. Although he couldn't quite match his 3:48.17 from Trials, he extended his lead on every length to win comfortably over second place finisher Michael McBroom of The Woodlands, who touched in 3:50.71. Jacob Ritter, competing unattached, swam a 3:53.09 to take third. After battling it out for a spot on the US Olympic Team just over a month ago, Bluefish Swim Club's Laura Sogar and Rattler Swim Club's Andrea Kropp went head-to-head again tonight. Sogar came out on top this time in 2:25.15, with Kropp in second in 2:25.40. Sogar took fourth at Trials in 2:24.82, while Kropp touched third in 2:24.82, with Rebecca Soni and Micah Lawrence claiming the top two spots. Emily McClellan of the J-Hawk Aquatic Club rounded out the top three tonight in 2:27.49. After trailing Arizona's Kevin Cordes for nearly the entire race, Palo Alto Stanford's Bernard Johnson reeled him in on the final 25m and touched first at the wall in 2:10.87, just a hair ahead of Cordes' 2:10.92. Cordes lowered his own 17-18 National Age Group Record of 2:11.88, which he set in prelims this morning. 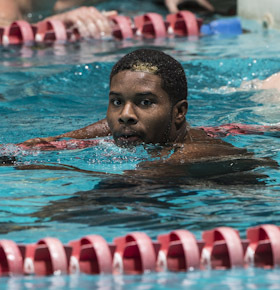 Both swimmers eclipsed their times from Olympic Trials, as Johnson had placed sixth in 2:11.47 and Cordes 12th in 2:13.26. Johnson moves up to 21st in the world rankings, with Cordes now 22nd. Trojan Swim Club's Mihail Alexandrov chased down Indiana's Cody Miller to take third in 2:11.62. Athens Bulldog's Megan Romano kept the ball rolling after her meet record in the 100m free last night, smoking the women's 200m back from lane one in 2:09.08, a time that would've placed fourth at Trials. Romano did not contest the event in Omaha, but entered the meet with a seed time of 2:11.74. She is now ranked 17th in the world in the event. Canadian Genevieve Cantin gave Romano a run but came up short, finishing second in 2:10.31. Great Britain's Karley Mann rounded out the top three in 2:10.95. Up-and-coming backstroke stars Jacob Pebley of Corvallis Aquatics and John Conger of Rockville Montgomery battled it out for bragging rights in the men's 200m back. After flipping fourth and fifth at the 100m mark, the two swimmers began to pull away before Pebley took charge to win in 1:57.57, the 22nd fastest time in the world this year. Conger touched second in 1:58.14, with Santa Clara's Eric Ress in third at 1:58.42. Cory Chitwood of the Northern Kentucky Clippers, who qualified first this morning in 1:57.41, slipped to fourth in 1:59.13. Both Conger and Pebley improved upon their Trials times of 1:58.97 (Conger) and 1:59.46 (Pebley).